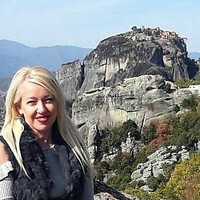 My name is Domna and I would be very pleased to be your Destination Expert in Greece! I was born and raised in Crete, one of the most amazing Greek islands, the birthplace of the Minoan Civilization. My long-term experience in the Travel Industry, my deep knowledge of my beloved homeland, along with my “passion” to meet the expectations, needs and desires of my guests, provides me with the chance to welcome you to Greece, the land of the eternal, bright light: The land of the gods! •	To get acquainted with the legendary history, culture and gastronomy. •	To explore our magnificent islands. •	To visit the spectacular mainland. •	To enjoy the deep blue sea and the endless sunshine. •	To discover our mythical tales. •	To live memorable experiences. This review is for Antonis. This review is for Hara. The tour guide was extremely helpful, thoughtful and knowledgable. She was also great fun. Chris the driver was also extremely helpful for the two elderly participants. This review is for Vangelis. Our hotel in Athens was unsatisfactory. This hotel caters to tour groups. Every morning at breakfast it is a fight to find a place to sit. During my first stay of several nights, my room was tiny and unsatisfactory. The staff, on the other hand, were good and responded well to my requests to improve the room. In Crete our hotel is excellent. My drivers were all good. The trip was utterly wonderful. We asked for knowledgeable guides and all had advanced degrees. An education every day. Affordable too. Dream trip. Antonis was amazing. He worked with me to develop a perfect trip for my family! He exceeded my expectations. Each experience that he arranged for us was superb and tailored to our needs and likes. Everything was easy and smooth. I can't wait to work with him again. Celebrated our Golden Birthday in Greece and it was the best birthday ever!!! Thank you Vangelis for doing a great job in managing our big group of 20 paxs and making it a very happy and memorable trip for our family. Vangelis we are so grateful for all the extra services that you have extended to us that made our birthday event more special and possible. We enjoyed Greece and hope we will have the opportunity to come back again in the future. We have traveled a lot and without a doubt this was the best vacation ever! Antonis is just the best. I cannot say enough on how great we were treated everywhere we went. Greece is just amazing and with Antonis setting up our itinerary it was even better then we had thought possible. We had never traveled on a prepaid, everything-arranged-in-advance package before, but thought it might be helpful in Greece. I stumbled upon Trip Me while searching for such a program and was very happy that I did. Antonis is an extraordinary agent, who is responsive, extremely helpful, and very knowledgeable. About a week before we were to arrive in Athens, for example, he wrote to us saying that the layover in Athens between arrival and our flight to Crete would be 5 hours. He suggested that rather than waiting at the airport, we take a tour—at no extra expense—to Sounio to see the Temple of Poseidon. We agreed and are so glad that we did. He also upgraded our hotel in Santorini at no extra cost. Antonis met us at the airport, greeted us warmly, and explained everything about our upcoming trip. He had 2 copies of an invaluable, detailed and laminated (!) schedule for the 15 days we would be in Greece. He also gave us ferry tickets and vouchers for our trips to Santorini, Mykanos, Delos, and Athens, so all we had to do was show up at the docks. This was greatly facilitated by our very punctual and competent drivers, who picked us up at our hotels and brought us directly to the ships. All of the drivers spoke English, were very personable, and we learned a great deal from them. Dimitris, our driver in Athens was our driver to Sunio. We immediately felt comfortable with him and enjoyed the trip very much. He took us to his favorite taverna in Sounio, where we had a great lunch and enjoyed our conversations with him and the taverna owner. Another driver, Nikita, should be singled out for the way he navigated the incredible roads in Santorini with amazing skill and great humor. Antonis not only has a group of excellent drivers, he also works with extremely professional, knowledgeable, charming, and interesting guides, who all spoke very highly of him as a colleague, supervisor, and honest businessman. Our guides—Knossos (Vangelis), Apokoronas (Giannis), Pyrgos and Megalachori, Akrotiri (Neža), Delos (Athena), a “foodie” tour in Athens (Tiama), and the Acropolis, and highlights of Athens (Zakia)—were all first rate, extremely interesting, willing to modify the tours to our individual interests, and enthusiastic about the sites they showed us. Antonis’ choice of guides and tours for us was perfect. We always felt that we had a special experience of the places we visited. All the hotels Antonis chose were very centrally located and some had wonderful views (Chania and Mykonos). Our favorite hotel was Olive Green in Heraklio. We were surprised and happy to receive a goodie bag full of wonderful Greek products. We think that the best gift Antonis gave us was a personal connection with Greece and the people who helped us know and love it. From the onset of trip planning, I had some specific criteria as to what I wanted to see and cover. Antonis designed my trip exactly as I wanted it. Although, it had multiple parts, i.e. ; mainland, hotels, tours, islands, ferry travel, transfers, air fare and coordination with the balance of my travel. Antonis made the schedule and logistics seamless. Loved GREECE and Antonis' professionalism and planning was superb!!!!! Very hands on, great job all through our trip. Checked to be sure everything was as expected.Great detail person, gave us info on a very good restaurant close to our hotel. You will not be disappointed in his planning or his prices. I would highly recommend the travel agency and Antonis. Antonis was very responsive before, during and after our trip. A true Professional. The trip itinerary was locked down quickly and hassle free. We were warmly greeted upon arrival and felt comfortable throughout. Towards the end of the trip there was a minor glitch but Antonis responded very promptly, even on an early weekend morning! His recommendations for restaruants serving good food were especially excellent. Even after the trip after we had returned home, Antonis continued to be responsive. Antonis, thanks very much; you made our visit to beautiful Greece a most memorable experience! He was very responsive to questions and concerns before the trip. All the arrangements that were made were excellent and the drivers were courteous and prompt. We had a trip delay due to weather and needed to scramble for a new hotel on short notice and change ferry tickets to another day. He didn't try to contact us at the hotel and we needed to make all the changes ourselves. Antonis was the most gracious tour operator that I encounter! He was always available during our trip through Greece. Everything went so smoothly that mostly I will reach him to say thank you for every leg of our tour! Antonis provided superb advice and service. His ideas for our trip were excellent and all his arrangements for hotels, drivers and ferries worked exactly as expected. Antonis, did a wonderful job for us in sorting out a really good itinerary for our 13 days in Greece. He met us at our first hotel in Athens and gave us all the paperwork needed to see us through the entire trip. We highly recommend his knowledge and services. My wife and I decided to take a trip to Greece, including Athens, Mykonos, and Santorini. We also invited our daughter, son in law and granddaughter to join us. So I thought it would be good if I could find someone who lives there that could serve as our travel agent. It was then that I stumbled upon a web site, "Trip.Me" which had an agent in Greece that would be available to help with planning trips. The person available was Antonis. So we decided to look into this. We then contacted him and he showed a genuine interest in helping us. Then we submitted our plans to him and began the process. So as we were planning our trip we had to make a few changes, and luckily Antonis was very accommodating and very happily to make any changes we requested. So after changing the itinerary 5 times (due to changes in our schedules), we finally got it right. Since we were taking my granddaughter were assured we would have a bassinet at all the hotels for her (we did) and a child car seat in any cars or buses we used (we had that to!). Our trip lasted 9 days, starting in Athens, then to Mykonos and then Santorini and then back to Athens. Then we were notified before leaving that one of the hotels which we were booked for, had overbooked. Antonis looked into this and had assured us he would take care of things (I had this happen to us years ago and I know that hotels do this all the time.) So what Antonis did was to book us in what I consider the nicest hotel in Athens: The Athens Hilton, and at no extra cost to us! When we departed on our trip from Dulles Airport near DC, to be honest, I was unsure if anything would go right. Surprisingly, when we arrived at the Airport in Athens we were met with a young man holding a sign showing my name, a very comforting thing! He then took us to the Hilton where we met with Antonis (another comforting thing) where he personally welcomed us to Greece. Then he gave us all our tickets (High speed ferries to the islands and airline tickets back to Athens) and gave each one of us laminated cards with the complete itinerary. Also because he felt he needed to compensate us for having to change hotels, he provided a free car rental and also a personal tour of the island of Santorini at no expense to us! The trip itself was amazing. All went very well and what was promised was delivered. It truly was one of those trips that will be most memorable for a lifetime. Thank you Antonis and Trip.Me! Antonis designed a trip to fit our wants and needs. He was very good at organizing the trip and quick to answer any questions we had. I would highly recommend him to anyone for your Greek trip planning. We really appreciated Antonis’s help in our Greek trip. We’ve never been to Greece and felt like we needed help. Everything ran very smoothly and we had a great time. Antonis kept in touch and made sure we had Rowe needed. We hope to go again! From Athens to Santorini and back to Athens. From the airport to the hotels, ferry and back to the airport, we didn’t have to worry about our pick up and drop off. From the taxi drivers , the ferry ride, the hotel personnel were all wonderful .Our itinerary, our tour guide Michaek in Mykonos we enjoyed his company and expertise.And of course, the one that made it possible was Antonis. He was patient and listened to my family’s needs and questions on this trip right from the beginning that I didn’t have any worries. And he delivered, I have no complaints .Antonis and Greece has a special place in our hearts now. Efharisto !!! Very good planing of the trip. Trip very well organized. Avaible for our questions throughout all our trip. Personalized our trip. Antonis was very helpful and easy to work with. We enjoyed our trip immensely. I only wish we had been able to meet him in person. Antonis was a LIFESAVER! He planned our entire 10 day trip to Greece within hours of our arrival. Hotels, tours, transfers everything! It was AMAZING! Antonis met us immediately upon arrival to our hotel, explained what we were going to do, where we will stay, all the transportation to all the islands and excursions were handled meticulously. He also was available via WhatsApp pretty much any time of the day and night to answer questions. HIGHLY RECOMMEND Antonis. Very accessible throughout the trip. There to answer questions, plan additional excursions and put your mind at ease when concerns arose. Great service everything was as expected. Hara did a wonderful job coordinating the tours and last minute requests. Thanks Hara for a wonderful trip. Overall, we very much enjoyed the trip. Our guides in Athens, Heraklion, Chania and on the Peloponnese tour were wonderful. All of our transfers were excellent and the hotels Antonis were good. 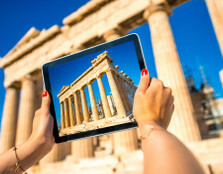 We especially appreciated the location of the Airotel Parthenon in Athens and the modern style and features of the Olive Green Hotel in Heraklion. We loved Crete and wish we had seen more of it rather than spend time at the rocky beach in Santorini. Antonis is very personable and truly cares that you have an enjoyable experience. He met us in person in Athens and delivered all our tickets and vouchers we would need along our way. When I had a question he was readily available. Antonis was very responsive from start to finish. He happily adjusted the itinerary multiple times for me until I had exactly the trip I wanted. He met us the first night at the hotel with everything we needed for the entire trip (plane tickets, ferry tickets, arranged tour tickets and information). He also gave me and each of my two children (25yr and 22yr) a welcome gift bag filled with yummy Greek specialties. He arranged private transfers for us and everything went smoothly without a hitch from start to finish. The hotels and their locations were awesome and we would not change a thing about our trip. My kids and I all agree that this was the best and most stress free trip we have been on thanks to Antonis. I would highly recommend Antonis to any of my friends or family planning a trip to Greece. If I ever go back, I would only use Antonis to help plan it. Antonis was very professional, and he replied promptly to email questions. By and large the trip was well planned - a good balance of tour time and alone time - and most enjoyable. All the guides and drivers were great. My major issue was with the full day Santorini Tour: its a little too long and requires too much exertion (hill climbing) for seniors like ourselves. Also, it was disappointing that we missed 3 of 6 breakfasts due to early departures. This trip was far beyond expectations and Antonis was exceptional. The trip was so well planned. Antonis met us at the airport personally and shared our detailed itinerary, which clearly outlined all activities with pick up and drop off times. Drivers arrived promptly to pick us up and drive us to each destination (to and from hotels and fairies). Everyone was prompt, friendly, and professional. They answered our questions and made us feel very welcomed! Our activities and guides were beyond amazing. Our group (consisting of four) now all wonder how we ever go back to traveling without Antonis. He personalized our entire vacation and was always available along the way with any minor questions we had. It was an amazing vacation without stress or worry for anything. Thanks Antonis!!!! My trip to the Greek Island using Trip.me was outstanding. the process was easy from the start and I was "assigned" to a travel Agent (Vangelis) within 24 hours. It was easy to customize my trip and Vangelis was very quick to accommodate my requests. You obviously don't have the flexibility that you would have if you designed your trip yourself from scratch, however, if you do not have the time or desired to do that, trip me offers a great alternative and customized solution. The trip ended up better than I expected and I had an amazing time in Greece. Vangelis met me personally when I arrived in Athens, provided me with all the documents and tickets required for my trip and all explanations I needed. All shuttles, activities, plane and boat tickets were all arranged on beforehand and ran like a clock. He contacted me during the trip to ensure that everything was going well and updated me several times about departure times and meeting location for shuttles etc... It was good old fashion travel agent work...like it was in the times when "good service" was more than just having a convenient website... I had a great time and could not have been more pleased with the service! He was very informative and all details were taken care of ! Everything was well coordinated. The hotels were excellent. Antonis was so gracious to help us on a last minute change of plans that made our trip so amazing and complete. I would love to Thank Antonis and family for the wonderful gift of jams and Olives. It was so delicious. Antonis did a great job of arranging our trip activities, It was so nice to have the transportation, hotels and trip details set up for us. Antonis was available to answer any questions and was able to retrieve my purse which contained all my passport, money and credit cards! This is because they use private transports which were always on time and very professional. We had a wonderful trip to Greece and highly recommend Antonis. We really enjoyed our time in Greece organised by Antonis, (just over two weeks).. The highlight of our trip was a private 4 day tour to the ancient sights of mainland Greece with excellent guide Mrs Zakia Koutsogianni and wonderful driver Christos. They both gave so much and went out of their way to make sure we enjoyed ourselves. We can’t thank them enough. The rest of our trip went well, all ferries, transfers and tours well organised. We thought the hotel on Mykonos could have been in a better location, it was a long walk in to town on busy dangerous roads and you had to wait an hour for the bus. Some times the third bed in hotels ( I travelled with my parents ) could have been better . l had to complain in Santorini as the bed was a very narrow couch ( unmade) Luckily the manager was helpful and sorted another room for us. But overall good. Antonis was amazing and very thorough! He povided options and ideas based on a budget I provided. The process was easy and didn't have to worry about a thing! A detailed itinerary was provided before the trip confirming hotels, pick up times, ferry schedules. Once in Greece met with Antonis and he provided all the tickets and everything else I needed for my trip! It was great not having to worry about the small details and unexpected problems. Our trip to Greece was amazing!!! Antonis was so thorough from our first email to our phone conversation to our meeting in Greece. Everything little detail was organized and easy to follow with our itinerary highlighted and laminated to boot. Antonis made recommendations and listened to what we wanted for our trip. It was definitely tailor made for us. Our accommodations blew me away!! We would definitely recommend Antonis and Trip Me for your travels. We cannot wait to return to Greece. Antonis was extremely helpful at all times. Excellent services. My travel agent Antonis was terrific! He quickly answered all of my questions, gave suggestions, and made all requested changes. When I got to my destination, he had a packet waiting with all the information I needed for the 3 week trip- including transfers and tour vouchers. When I emailed him questions, he responded immediately. It was a very good experience. Amazing experience! All was take care of. Knowledgeable tour guides made all extra special. Antonis was very friendly , professional and organized. He was also very attentive and send us messages daily inquiring about our tour and well being. He made us feel secure and taken care of. All the details were properly addressed in an ordered and timely fashion and this in turn allowed us freedom to do what we went there for which was .... enjoy our vacation. Greece is a lifetime experience everyone should see and Antonis made it spectacular, thank you Antonis. Everything is thought of and taken care of. Our guide to the Peloponese was very knowledgable and made the tour a true highly enjoyable learning experience, Stasis made ancient times become a reality in our minds, it was just awesome. The Delos tour was also superb as our tour guide really put his heart and soul in his descriptions, one could see how much he enjoyed his job and how much he loves and respects the history of Greece. It was really inspiring. Antonis did an excellent job in setting up our personalized trip and he was attentive to our wishes. We wanted to Island hop for two weeks and not take a group adventure or cruise. He was in regular contact via Whats App. One minor glitch with a hotel was fixed immediately. All tours he set up were excellent with quality guides. Our taxi/ transfer drivers were first class. We began our trip with a couple of days in Mykonos then on to Santorini for 4 days - it was wonderful! On our return to Athens, we did the city tour one day then headed off on the Classical Greece tour (4 days - Mycena, Olympia, Delphi and Meteora. The guides on both tours were fantastic. Back in Athens we took the 3-island day cruise (crowded bu nice to see the islands) on day and ended our visit with Poisidon's temple at Sounion. Thanks to Vangelis, our tour of Greece was a fantastic experience! I travelled with a girlfriend for 14 days with stays in Athens, Mykonos, Santorini and Crete . Antonis helped put our personalized trip together.From the moment we arrived in Athens everything we planned came together beautifully. Our drivers, hotels, choices of sightseeing tours, Highspeed ferries, private guide for a day to find my ancestral village, Antonis made the right choices for us. Antonis and his lovely daughter met us at our hotel to welcome us to Greece , provide all hotel vouchers, ferry/airline tickets intinery etc. not to mention some lovely treats from his family farm. He kept in touch with us throughout the trip, we had 1 incident in Santorini , that he handled and resolved immediately. I have already suggested to friends that if planning a trip to Greece that Antonis is ‘The Man’. Antonis was the best. He planned everything very well where we wanted to go. Our tour was cancelled days before we got to Santorini and he informed us right away and arranged another tour for us without even asking him. He was very accommodating and helpful. It was the best tour package ever!! We will definitely recommend trip.me to my family and friends. He’s the best! Antonis made it very easy to use. Antonis was very thorough and attentive to our needs both before and after our trip. Our trip was 14 days in Greece/Greek Islands. Antonis set up our complete itinerary, including Hotels, transfers and tours. He did an amazing job, we enjoyed the Hotels and tours, plus not having to worry about being picked up at airports etc. He is a fabulous communicator, he kept in touch throughout the trip and was always available for questions. The trip was great. He did a great job creating an eclectic mix of locations to appeal to all 4 of us, from my 86 year old mom, to my sister and husband. Antonis was simply the best travel expert we have ever encountered. We have traveled internationally 10+ times and he made this process the simplest and took care of all the details, however small or large. He was gracious enough to meet us at our hotel upon arrival, after 11:00 PM to greet us as well as talk us through the entire trip. He checked on us daily to make sure everything was going as planned. He made us feel as if we were a king and a queen. Obviously his country is simply fantastic but he made the trip so much more. He is knowledgeable, educated and very good at what he does. Thank you so much Antonis, you have set the bar very high for future tour planners. You were a joy to work with. The trip was excellent. 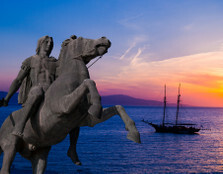 The trip was well thought out and provided us with view of the wonders of ancient Greece. Transportation was provided to and from the airport. The drivers were fluent in English, were personable, professional, and polite. Antonis Alexandrou met us at the hotel and explained the trip answering all of our questions. He was informative and welcoming. I would have no concerns regarding using his agency again. The guides' English was certainly understandable but not as good as the drivers. The guides were knowledgeable and passionate about their fields. 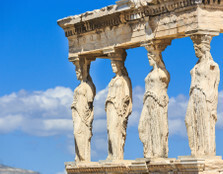 Because our trip was in November, we choose to explore ancient classic Greece with a 4 day road trip and time in Athen visiting the Acropolis/Parthenon and National Archeological Museums. Antonis found excellent tours and guides which significantly contributed to our experience! One of our best trips ever! Overall Antonis was helpful, he met us at the hotel to go over the itenary and made quick adjustments to the trip when we needed. We joined a group tour for part of the trip and did not have a good experience. The tour company was Chatour, my kids were the only kids among the 30+ tourists and Unfortunately we encountered some grumpy old people who made it clea that they did not wish the kids to be there despite the fact that the kids were well behaved for their age and that it was a family friendly tour. The tour guide Stephanie did not do enough and early enough to make it clear that it was not okay for fellow passengers to harrasss my kids. I communicated to Antonis but was told that there wasn’t much he could help. Without a doubt the best tour planner we have encounter in over 20 years of travel anywhere in the us or abroad. Antonis attention to detail, expert and profesional service, and extrematly personal custumer service made this trip, from planning to conclusion, our best Ever! 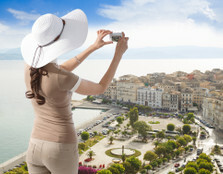 (Our trip to Greece was followed by a tour of Sicily and the difference on tour company and specially our destination expert, Antonis, was abysmal) Special high points: 1st day in-person welcome and tour schedule brief, day to day consultation, via WhatsApp or phone, for best places to eat, events, and tour schedule, last day tour review, and above all the great homemade taste of Greece welcome presents. I highly recommend Antonis for all your trip needs in Greece. Most wonderful services and Happy I went through you all for this trip. Antonis was amazing!! He organized everything and made our travels seamless. We were greeted at all our destinations. The hotels he choose were excellent. We started in Athens, followed by Naxos and finished with Santorini. We had a nice mixture of booked excursions and free time to explore on our own. I would highly recommend him. We had an awesome 10-day vacation in Greece in September/October 2017 thanks to Antonis! I was not familiar with trip.me before this trip, but the company and Antonis were great to work with. He customized our itinerary to work around our flight times. He met us on our arrival in Athens and personally explained all our paperwork and excursions. He was available by text throughout our island visits and Athens visit. Everything worked like clockwork so we didn't really need to contact him very much. We had a fantastic trip and we thank Antonis very much! After some basic research and inquiries on the internet about sailing the Cyclades for one week, Antonis' response seemed the best for our needs...in response to an email i sent, Antonis telephoned me immediately to answer all my questions and to further discuss the trip! The communication was very professional and precise. When we met in Athens to set off on our sailing journey, he was punctual and greeted us very warmly (home made gifts by his mom...jams, olives, olive oil!). We then met Jason, the owner of the vessel and he too made us feel welcome aboard! Our skipper, Roger Hare was exceptional...extremely knowledgeable, interesting and very pleasant! His calm demeanor as a skipper helped us get through some rough winds and he taught us much about sailing...we were novices! All in all it was a super holiday! Thank you! All aspects of the trip were planned, organised and implemented in a completely professional manner. Antonis made sure we understood all elements of the itinerary and then made himself available in the event we needed more explanation. Also, my wife's luggage was lost for several days and he personally pursued a solution even though this was not really part of the contract. Yes would recommend to friends and family. The portion of our trip to Greece that Antonis planned was perfect for us in every way. Based on emails and conversations with him before the trip, he tailor made the tours to meet our needs and wishes. It was lovely to be met at the airport and then at the hotel for orientation. Best of all was the personal attention and 24/7 availability for questions and concerns. He even extended himself to us the whole other month we are staying in the country on our own. Thank you Antonis and thank you to your mother for the wonderful homemade Greek delicacies. The transfer, connection, land & cruise tour all went well. Antonis took extra step to provide us a place for short rest and shower on the last day before we headed to airport. He responded promptly when we need clarification and help. At the quotation stage, Antonis has been prompt in providing proposals customising the itinerary according to our preferences, hence our trip were finalized and confirmed in a relatively short period of time. Antonis is a meticulous and organized professional. He gave us a day by day itinerary with details of time and place regarding our various programmes and because of that, we were very at ease during the holiday. At one point when we flied back to Athens from the island Crete, we encountered problem with the airline company regarding the prepayment for our checked baggage, we phoned Antonis on the spot and we were told to pay first and that the money would be refunded to us. This refund was made very quickly by the driver who picked us up at the Athens airport right after the flight. To round up, Antonis impresses us as a polite, sincere and concientious professional of the travel industry. I liked the idea that I would be 'connected' to a travel expert in the country in which I had chosen to visit. Working with Antonis while planning my trip to Greece was 'stress free' for me! I gave Antonis a basic outline, and he presented me with a starting itinerary, and working together, we tweaked it until it 'fit' perfectly! When I had questions or asked for clarification, Antonis would have an answer for me by the next morning. I loved that transportation between the airport and ferries were included. Tours while in Greece (day in Athens, and 4 day Ancient Greece), were arranged by Antonis and were led by knowledgeable Guides. I enjoyed the people that I traveled with during the 4 day excursion. All hotels were comfortable and the staff friendly. The hotels were centrally located to the town center and easily accessible to public transportation if needed. Antonis met me at the hotel when I arrived and went over the itinerary and passed along all hotel vouchers and ferry tickets. The personal touch was much appreciated. Antonis was excellent. We were able to contact him easily from Australia and whilst in Greece. Every thing worked to plan snd the accomodation was very nice. Antonis and his entire team were amazing my entire trip. I'm a very defiant individual and he managed all my needs and expectations with grace, patience and professionalism. He took me out for lunch which I was most touched by and made my entire trip feel personal. I took some photos that Antonis really loved and would recommend him and his entire team to all my friends travelling to Greece. Everything was in place as much as it could be and the overall trip was fabulous and most memorable. Where do I even begin! Greece has been a destination on my bucket list for several years now. From the beginning Antonis was a great pleasure to work with. He went above and beyond in setting up this great adventure for me. He was very responsive to all communication and detailed with all questions asked. From the beginning it seemed as if we have known each other for years. I told him what I was looking for in my vacation and he seem to put it all together flawlessly. Greece is a country filled with rich history and culture. Every city and site we saw was mesmerizing in so many different aspects. Every single part of our trip was detailed with all pick ups drop off's and tour guides. Antonis even had a detailed packet with our itinerary and all information needed! Our hotel accommodations were just as expected and timeline was kept perfectly. I highly recommend the agency to anyone thinking of visiting Greece! I can not say enough about the professionalism, great spirit and caring attitude of Antonis. He made our trip that much more special and enjoyable. We were very happy with the excellent services provided by Antonis from helping us book lodging in multiple locations, figuring out transportation (we were in Greece pre-'season' with reduced ferry service) to meeting us in our Athens hotel with final itinerary and tickets. He was not only helpful, responsive in a timely manner (multiple emails and phone conversations), and knowledgable, but conscientious and friendly. I highly recommend his excellent services for travel in Greece. We were pretty happy with the arrangements made and the extra assistance extended when we had our luggage issues. The itinerary prepared was just right for us, given the number of days we intended to stay. The choice of day trips/cruises around Athens was good, and we thoroughly enjoyed it. The choice of accommodation was also good, and we appreciated making Athens our base in order to store the bulk of our luggage in order to travel light to surrounding islands. This is my first booking with Antonis. He is professional, honest and knowledgeable. The prices that he had quoted for my trip are reasonable.